For other uses, see Transportation (disambiguation). Penal transportation or transportation was the relocation of convicted criminals, or other persons regarded as undesirable, to a distant place, often a colony for a specified term; later, specifically established penal colonies became their destination. While the prisoners may have been released once the sentences were served, they generally did not have the resources to get themselves back home. Banishment or forced exile from a polity or society has been used as a punishment since at least Ancient Roman times. The practice reached its height in the British Empire during the 18th and 19th centuries. Transportation removed the offender from society, possibly permanently, but was seen as more merciful than capital punishment. This application was used for criminals, debtors, military prisoners, and political prisoners. Penal transportation was also used as a method of colonisation. For example, from the earliest days of English colonial schemes, new settlements beyond the seas were seen as a way to alleviate domestic social problems of criminals and the poor as well as to increase the colonial labour force, production, and overall benefit of the realm. Initially based on the royal prerogative of mercy, and later under English Law, transportation was an alternative sentence imposed for a felony; it was typically imposed for offences for which death was deemed too severe. By 1670, as new felonies were defined, the option of being sentenced to transportation was allowed. Forgery of a document, for example, was a capital crime until the 1820s, when the penalty was reduced to transportation. Depending on the crime, the sentence was imposed for life or for a set period of years. If imposed for a period of years, the offender was permitted to return home after serving out his time, but had to make his own way back. Many offenders thus stayed in the colony as free persons, and might obtain employment as jailers or other servants of the penal colony. England transported its convicts and political prisoners, as well as prisoners of war from Scotland and Ireland, to its overseas colonies in the Americas from the 1610s until early in the American Revolution in 1776, when transportation to America was temporarily suspended by the Criminal Law Act 1776 (16 Geo. 3 c.43). The practice was mandated in Scotland by an act of 1785, but was less used there than in England. Transportation on a large scale resumed with the departure of the First Fleet to Australia in 1787, and continued there until 1868. Transportation was not used by Scotland before the Act of Union 1707; following union, the Transportation Act 1717 specifically excluded its use in Scotland. Under the Transportation, etc. Act 1785 (25 Geo. 3 c. 46) the Parliament of Great Britain specifically extended the usage of transportation to Scotland. It remained little used under Scots Law until the early 19th century. In Australia, a convict who had served part of his time might apply for a ticket of leave, permitting some prescribed freedoms. This enabled some convicts to resume a more normal life, to marry and raise a family, and to contribute to the development of the colony. In England in the 17th and 18th centuries criminal justice was severe, later termed the Bloody Code. This was due to both the particularly large number of offences which were punishable by execution, (usually by hanging), and to the limited choice of sentences available to judges for convicted criminals. With modifications to the traditional Benefit of clergy, which originally exempted only clergymen from civil law, it developed into a legal fiction by which many common offenders of "clergyable" offenses were extended the privilege to avoid execution. Many offenders were pardoned as it was considered unreasonable to execute them for relatively minor offences, but under the rule of law, it was equally unreasonable for them to escape punishment entirely. With the development of colonies, transportation was introduced as an alternative punishment, although legally it was considered a condition of a pardon, rather than a sentence in itself. Convicts who represented a menace to the community were sent away to distant lands. A secondary aim was to discourage crime for fear of being transported. Transportation continued to be described as a public exhibition of the king's mercy. It was a solution to a real problem in the domestic penal system. There was also the hope that transported convicts could be rehabilitated and reformed by starting a new life in the colonies. In 1615, in the reign of James I, a committee of the Council had already obtained the power to choose from the prisoners those that deserved pardon and, consequently, transportation to the colonies. Convicts were chosen carefully: the Acts of the Privy Council showed that prisoners "for strength of bodie or other abilities shall be thought fit to be employed in foreign discoveries or other services beyond the Seas". During the Commonwealth, Cromwell overcame the popular prejudice against subjecting Christians to slavery or selling them into foreign parts, and initiated group transportation of military and civilian prisoners. With the Restoration, the penal transportation system and the number of people subjected to it, started to change inexorably between 1660 and 1720, with transportation replacing the simple discharge of clergyable felons after branding the thumb. Alternatively, under the second act dealing with Moss-trooper brigands on the Scottish border, offenders had their benefit of clergy taken away, or otherwise at the judge's discretion, were to be transported to America, "there to remaine and not to returne". There were various influential agents of change: judges' discretionary powers influenced the law significantly, but the king's and Privy Council's opinions were decisive in granting a royal pardon from execution. The system changed one step at a time: in February 1663, after that first experiment, a bill was proposed to the House of Commons to allow the transporting of felons, and was followed by another bill presented to the Lords to allow the transportation of criminals convicted of felony within clergy or petty larceny. These bills failed, but it was clear that change was needed. Transportation was not a sentence in itself, but could be arranged by indirect means. The reading test, crucial for the benefit of clergy, was a fundamental feature of the penal system, but in order to prevent its abuse, this pardoning process was used more strictly. Prisoners were carefully selected for transportation based on information about their character and previous criminal record. It was arranged that they fail the reading test, but they were then reprieved and held in jail, without bail, to allow time for a royal pardon (subject to transportation) to be organised. Joseph Lycett, an artist transported for forging bank notes, The residence of Edward Riley Esquire, Wooloomooloo, Near Sydney N. S. W., 1825, hand-coloured aquatint and etching printed in dark blue ink. Australian print in the tradition of British decorative production. Transportation became a business: merchants chose from among the prisoners on the basis of the demand for labour and their likely profits. They obtained a contract from the sheriffs, and after the voyage to the colonies they sold the convicts as indentured servants. The payment they received also covered the jail fees, the fees for granting the pardon, the clerk's fees, and everything necessary to authorise the transportation. These arrangements for transportation continued until the end of the 17th century and beyond, but they diminished in 1670 due to certain complications. The colonial opposition was one of the main obstacles: colonies were unwilling to collaborate in accepting prisoners: the convicts represented a danger to the colony and were unwelcome. Maryland and Virginia enacted laws to prohibit transportation in 1670, and the king was persuaded to respect these. The penal system was also influenced by economics: the profits obtained from convicts' labour boosted the economy of the colonies and, consequently, of England. Nevertheless, it could be argued that transportation was economically deleterious because the aim was to enlarge population, not diminish it; but the character of an individual convict was likely to harm the economy. King William's War (1688–1697) (part of the Nine Years' War) and the War of the Spanish Succession (1701–14) adversely affected merchant shipping and hence transportation. In the post-war period there was more crime and hence potentially more executions, and something needed to be done. In the reigns of Queen Anne (1702–14) and George I (1714–27), transportation was not easily arranged, but imprisonment was not considered enough to punish hardened criminals or those who had committed capital offences, so transportation was the preferred punishment. There were several obstacles to the use of transportation. In 1706 the reading test for claiming benefit of clergy was abolished (5 Anne c. 6). This allowed judges to sentence "clergyable" offenders to a workhouse or a house of correction. But the punishments that then applied were not enough of a disincentive to commit crime: another solution was needed. The Transportation Act was introduced into the House of Commons in 1717 under the Whig government. It legitimised transportation as a direct sentence, thus simplifying the penal process. Non-capital convicts (clergyable felons usually destined for branding on the thumb, and petty larceny convicts usually destined for public whipping) were directly sentenced to transportation to the American colonies for seven years. A sentence of fourteen years was imposed on prisoners guilty of capital offences pardoned by the king. Returning from the colonies before the stated period was a capital offence. The bill was introduced by William Thomson, the Solicitor General, who was "the architect of the transportation policy". Thomson, a supporter of the Whigs, was Recorder of London and became a judge in 1729. He was a prominent sentencing officer at the Old Bailey and the man who gave important information about capital offenders to the cabinet. One reason for the success of this Act was that transportation was financially costly. The system of sponsorship by merchants had to be improved. Initially the government rejected Thomson's proposal to pay merchants to transport convicts, but three months after the first transportation sentences were pronounced at the Old Bailey, his suggestion was proposed again, and the Treasury contracted Jonathan Forward, a London merchant, for the transportation to the colonies. The business was entrusted to Forward in 1718: he was paid £3 (£5 in 1727) for each prisoner transported overseas. The Treasury also paid for the transportation of prisoners from the Home Counties. The "Felons' Act" (as the Transportation Act was called) was printed and distributed in 1718, and in April twenty-seven men and women were sentenced to transportation The Act led to significant changes: both petty and grand larceny were punished by transportation (seven years), and the sentence for any non-capital offence was at the judge's discretion. In 1723 an Act was presented in Virginia to discourage transportation by establishing complex rules for the reception of prisoners, but the reluctance of colonies did not stop transportation. In a few cases before 1734, the court changed sentences of transportation to sentences of branding on the thumb or whipping, by convicting the accused for lesser crimes than those of which they were accused. This manipulation phase came to an end in 1734. With the exception of those years, the Transportation Act led to a decrease in whipping of convicts, thus avoiding potentially inflammatory public displays. Clergyable discharge continued to be used when the accused could not be transported for reasons of age or infirmity. Penal transportation was not limited to men or even to adults. Men, women, and children were sentenced to transportation, but its implementation varied by gender and age. From 1660 to 1670, highway robbery, burglary, and horse theft were the offences most often punishable with transportation for men. In those years, five of the nine women who were transported after being sentenced to death were guilty of simple larceny, an offence for which benefit of clergy was not available for women until 1692. Also, merchants preferred young and able-bodied men for whom there was a demand in the colonies. All these factors meant that most women and children were simply left in jail. Some magistrates supported a proposal to release women who could not be transported, but this solution was considered absurd: this caused the Lords Justices to order that no distinction be made between men and women. Women were sent to the Leeward Islands, the only colony that accepted them, and the government had to pay to send them overseas. In 1696 Jamaica refused to welcome a group of prisoners because most of them were women; Barbados similarly accepted convicts but not "women, children nor other infirm persons". Thanks to transportation, the number of men whipped and released diminished, but whipping and discharge were chosen more often for women. The reverse was true when women were sentenced for a capital offence, but actually served a lesser sentence due to a manipulation of the penal system: one advantage of this sentence was that they could be discharged thanks to benefit of clergy while men were whipped. Women with young children were also supported since transportation unavoidably separated them. The facts and numbers revealed how transportation was less frequently applied to women and children because they were usually guilty of minor crimes and they were considered a minimal threat to the community. The outbreak of the American Revolutionary War (1775–1783) halted transportation to America. Parliament claimed that "the transportation of convicts to his Majesty's colonies and plantations in America...is found to be attended with various inconveniences, particularly by depriving this kingdom of many subjects whose labour might be useful to the community, and who, by proper care and correction, might be reclaimed from their evil course"; they then passed "An act to authorize.. the punishment by hard labour of offenders who, for certain crimes, are or shall become liable to be transported to any of his Majesty's colonies and plantations. For the ensuing decade, men were instead sentenced to hard labour and women were imprisoned. Finding alternative locations to send convicts was not easy, and the act was extended twice by the Criminal Law Act 1778 (18 Geo. 3 c. 62) and the Criminal Law Act 1779 (19 Geo. 3, c. 54). This resulted in a 1779 inquiry by a Parliamentary Committee on the entire subject of transportation and punishment; initially the Penitentiary Act was passed, introducing a policy of state prisons as a measure to reform the system of overcrowded prison hulks that had developed, but no prisons were ever built as a result of the act. The Transportation, etc. Act 1784 (24 Geo. 3 c. 56) and the Transportation, etc. Act 1785 (25 Geo. 3 c. 46) also resulted to help alleviate overcrowding. Both acts empowered the Crown to appoint certain places within his dominions, or outside them, as the destination for transported criminals; the acts would move convicts around the country as needed for labour, or where they could be utilized and accommodated. The overcrowding situation and the resumption of transportation would be initially resolved by Orders in Council on 6 December 1785, by the decision to establish a penal colony in New South Wales, on land previously claimed for Britain in 1770, but as yet not settled by Britain or any other European power. The British policy toward Australia, specifically for use as a penal colony, within their overall plans to populate and colonise the continent, would differentiate it from America, where the use of convicts was only a minor adjunct to its overall policy. In 1787, when transportation resumed to the chosen Australian colonies, the far greater distance added to the terrible experience of exile, and it was considered more severe than the methods of imprisonment employed for the previous decade. The Transportation Act 1790 (30 Geo. 3 c. 47) officially enacted the previous orders in council into law, stating "his Majesty hath declared and appointed...that the eastern coast of New South Wales, and the islands thereunto adjacent, should be the place or places beyond the seas to which certain felons, and other offenders, should be conveyed and transported;"...or other places. The act also gave "authority to remit or shorten the time or term" of the sentence "in cases where it shall appear that such felons, or other offenders, are proper objects of the royal mercy"
At the beginning of the 19th century, transportation for life became the maximum penalty for several offences which had previously been punishable by death. With complaints starting in the 1830s sentences of transportation became less common in 1840 since the system was perceived to be a failure: crime continued at high levels, people were not dissuaded from committing felonies, and the conditions of convicts in the colonies were inhumane. Although a concerted program of prison building ensued, the Short Titles Act 1896 lists seven other laws relating to penal transportation in the first half of the 19th century. The system of criminal punishment by transportation, as it had developed over nearly 150 years, was officially ended in Britain in the 1850s, when that sentence was substituted by imprisonment with penal servitude, and intended to punish. The Penal Servitude Act 1853 (16 & 17 Vict. c. 99), long titled "An Act to substitute, in certain Cases, other Punishment in lieu of Transportation," enacted that with judicial discretion, lesser felonies, those subject to transportation for less than 14 years, could be sentenced to imprisonment with labour for a specific term. To provide confinement facilities, the general change in sentencing was passed in conjunction with the Convict Prisons Act 1853 (16 & 17 Vict. c. 121), long titled "An Act for providing Places of Confinement in England or Wales for Female Offenders under Sentence or Order of Transportation." The Penal Servitude Act 1857 (20 & 21 Vict. c.3) ended the sentence of transportation in virtually all cases, with the terms of sentence initially being of the same duration as transportation. While transport was greatly reduced following passage of the 1857 act, the last convicts sentenced to transportation arrived in Western Australia in 1868. During the 80 years of its use to Australia, the number of transported convicts totaled about 162,000 men and women. Over time the alternative terms of imprisonment would be somewhat reduced from their terms of transportation. From the early 1600s until the American Revolution of 1776, the British colonies in North America received transported British criminals. Destinations were the island colonies of the West Indies and the mainland colonies that became the United States of America. In the 17th century transportation was carried out at the expense of the convicts or the shipowners. The Transportation Act 1717 allowed courts to sentence convicts to seven years' transportation to America. In 1720, an extension authorised payments by the Crown to merchants contracted to take the convicts to America. The Transportation Act made returning from transportation a capital offence. The number of convicts transported to North America is not verified - John Dunmore Lang has estimated 50,000, and Thomas Keneally has proposed 120,000. Maryland received a larger felon quota than any other province. Many prisoners were taken in battle from Ireland or Scotland and sold into indentured servitude, usually for a number of years. [page needed] The American Revolution brought transportation to the North American mainland to an end. The remaining British colonies (in what is now Canada) were regarded as unsuitable for various reasons, including the possibility that transportation might increase dissatisfaction with British rule among settlers and/or the possibility of annexation by the United States – as well as the ease with which prisoners could escape across the border. After the termination of transportation to North America, British prisons became overcrowded, and dilapidated ships moored in various ports were pressed into service as floating gaols known as "hulks". Following a disastrous experiment in transporting convicted prisoners to Cape Coast Castle (modern Ghana) and the Gorée (Senegal) in West Africa, British authorities turned their attention to New South Wales (in what would become Australia). From the 1820s until the 1860s, convicts were sent to Bermuda to work on the construction of the Royal Naval Dockyard and other defence works, including an area still known as "Convict Bay", at St. George's town. This notice on a bridge in Dorset warns that damage to the bridge can be punished by transportation. In 1787, the "First Fleet" of convict ships departed from England to establish the first British settlement in Australia, as a penal colony. The fleet arrived at Port Jackson (Sydney) on 26 January 1788, a date now celebrated as Australia Day. Norfolk Island was a convict penal settlement from 1788–94, and again from 1824-47. The First Fleet included boats containing food and animals from London. The ships and boats of the fleet would explore the coast of Australia by sailing all around it looking for suitable farming land and resources. In 1803, Van Diemen's Land (modern-day Tasmania) was also settled as a penal colony, followed by the Moreton Bay Settlement (Queensland) in 1824. The other Australian colonies were "free settlements", as non-convict colonies were known. However, the Swan River Colony (Western Australia) accepted transportation from England and Ireland in 1851, to resolve a long-standing labour shortage. Until the massive influx of immigrants during the Australian gold rushes of the 1850s, the free settlers had been outnumbered by English and Irish convicts and their descendants. However, compared to America, Australia received many more English prisoners. Transportation from Britain and Ireland officially ended in 1868, although it had become uncommon several years earlier. In British colonial India – including the province of British Burma (now Myanmar) and the port of Karachi (now Pakistan) – opponents of British rule were transported to the Andaman Islands. A penal colony was established there in 1857 with prisoners from the Indian Rebellion of 1857 (called the "Sepoy Mutiny" by the British). As the Indian independence movement swelled, so did the number of prisoners being transported. The Cellular Jail, also called Kālā Pānī or Kalapani (Hindi for black waters), was constructed between 1896 and 1906 as a high-security prison with 698 individual cells for solitary confinement. Surviving prisoners were repatriated in 1937. The penal settlement was abolished in 1945. An estimated 80,000 political prisoners were transported to this "torture machine" "in an 'experiment' that involved torture, medical tests, forced labour and, for many, death." France transported convicts to Devil's Island and New Caledonia in the 19th and early-to-mid 20th centuries. Devil's Island, a French penal colony in Guiana, was used for transportation from 1852 to 1953. New Caledonia became a French penal colony from the 1860s until the end of the transportations in 1897; about 22,000 criminals and political prisoners (most notably Communards) were sent to New Caledonia. The most famous transported prisoner is probably French army officer Alfred Dreyfus, wrongly convicted of treason in a trial in 1894, held in an atmosphere of antisemitism. He was sent to Devil's Island. The case became a cause célèbre known as the Dreyfus Affair, and Dreyfus was fully exonerated in 1906. Penal transportation is a feature of many broadsides, and a number of these transportation ballads have been collected from traditional singers. Examples include "Van Diemen's Land," "The Black Velvet Band," and "The Fields of Athenry." The British author William Somerset Maugham set a number of his short stories in the French Caribbean penal colonies. Franz Kafka's story "In the Penal Colony" was set in an unidentified location. The work was later adapted for several other media, including an opera by Philip Glass. One of the key characters in Charles Dickens' novel Great Expectations is an escaped convict, Abel Magwitch. Pip helps him in the opening pages of the novel, and he later turns out to be Pip's secret benefactor — the source of his "great expectations". 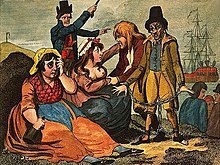 Magwitch, who had been apprehended shortly after the young Pip had helped him, was thereafter sentenced to transportation for life to New South Wales in Australia. While so exiled, he earned the fortune that he later would use to help Pip. Further, it was Magwitch's desire to see the "gentleman" that Pip had become that motivated him to illegally return to England, which ultimately led to his arrest and death. Timberlake Wertenbaker's play Our Country's Good, based on Thomas Keneally's novel The Playmaker, is set in the first Australian penal colony. My Transportation for Life, Indian freedom fighter Veer Savarkar's memoir of his imprisonment, is set in the British Cellular Jail in the Andaman Islands. The novel Papillon tells the story of Henri Charrière, a French criminal convicted on 26 October 1931 as a murderer, and exiled to the French Guinea penal colony on Devil's Island. A film adaptation of the book was made in 1973, starring Steve McQueen and Dustin Hoffman. The story of Essie McGowan in Neil Gaiman's American Gods is structured around her transportation and promoting the Cornish folklore in America. Penal transportation, typically to other planets, sometimes appears in works of science fiction. A classic example is The Moon is a Harsh Mistress by Robert Heinlein, in which convicts and political dissidents are transported to lunar colonies. In Heinlein's book, a sentence of lunar transportation is necessarily permanent, as the long-term physiological effects of the moon's weak surface gravity (about one-sixth that of Earth) leave "loonies" unable to return safely to Earth. ^ a b Maxwell-Stewart, Hamish; Watkins, Emma (n.d.). "Transportation". Digital Panopticon. Digital Panopticon Project. Retrieved 7 February 2019. ^ August 1650: An Act for the Advancing and Regulating of the Trade of this Commonwealth, Acts and Ordinances of the Interregnum, 1642-1660. Originally published by His Majesty's Stationery Office, London, 1911. "The Parliament of England taking into their care the maintenance and advance of the Traffick Trade, and several Manufactures of this Nation; and being desirous to improve and multiply the same for the best advantage and benefit thereof, to the end that ye poore people of this Land may be set on work, and their Families preserved from Beggary and Ruine, and that the Commonwealth might be enriched thereby, and no occasion left either for Idleness or Poverty:..."
^ Charles II, 1670 & 1671: An Act to prevent the malitious burning of Houses, Stackes of Corne and Hay and killing or maiming of Catle. ^ "An act to authorise, for a limited time, the punishment by hard labour of offenders who, for certain crimes, are or shall become liable to be transported to any of his Majesty's colonies and plantations." ^ a b "An act for the effectual transportation of felons, and other offenders, in that part of Great Britain called Scotland, and to authorize the removal of prisoners in certain places." ^ Cunningham. Growth of Eng. Industry and Com. in Mod. Times; 109, Cambridge, 1892. Cited in Karl Frederick Geiser, Redemptioners and indentured servants in the colony and commonwealth of Pennsylvania, Supplement to the Yale Review, Vol. X, No. 2, August, 1901. "There was a popular prejudice against subjecting Christians into slavery or selling them into foreign parts, but Cromwell did not draw any such distinctions. Not only did his agents systematically capture Irish youths and girls for export to the West Indies, but all the garrison who were not killed in the Drogheda Massacre were shipped as slaves to the Barbadoes." ^ 30 July 1649 Act empowering the Lord Mayor, Justices of Gaol delivery for Newgate, to transport threescore prisoners convicted of Felony and other heinous crimes, unto the Summer Islands or other new English Plantations. ^ "An act for the effectual transportation of felons and other offenders; and to authorize the removal of prisoners in certain cases; and for other purposes therein mentioned." ^ "Historic Landmarks". Townsville Daily Bulletin. Qld. : National Library of Australia. 2 October 1952. p. 5. Retrieved 19 March 2017. ^ "Australian Discovery and Colonisation". The Empire. Sydney: National Library of Australia. 14 April 1865. p. 8. ^ "An act for enabling his Majesty to authorize his governor or lieutenant governor of such places beyond the seas, to which felons and others offenders may be transported, to remit the sentences of such offenders." ^ "Criminal transportation". The National Archives. Retrieved 6 February 2019. Before 1776, all convicts sentenced to transportation were sent to North America and the West Indies. ^ R v Powell , Sixth session Proceedings of the Old Bailey 10th July, 1805 t18050710-23, page 401 (Old Bailey 10 July 1805). ^ Butler, James Davie (1896). "British Convicts Shipped to American Colonies". The American Historical Review. 2 (1): 12–33. doi:10.2307/1833611. JSTOR 1833611. ^ Christopher, Emma (2011) . A Merciless Place: The Lost Story of Britain's Convict Disaster in Africa. Oxford: Oxford University Press. p. 5. ISBN 9780191623523. Retrieved 2018-03-24. With the American War of Independence all but lost and hope of restarting the transportation of convicts to the Americas dwindling fast, Britain had begun sneakily banishing its criminals to West Africa. ^ "History of Andaman Cellular Jail". This is about Andaman Cellular Jail. Archived from the original on 18 January 2007. ^ a b "Hundred years of the Andamans Cellular Jail". The Hindu. 21 December 2005. Archived from the original on 30 September 2007. ^ Scott-Clark, Cathy; Levy, Adrian (22 June 2001). "Survivors of our hell". The Guardian. Retrieved 7 February 2019. ^ Statiev, Alexander (Spring 2005). "The Nature of Anti-Soviet Armed Resistance, 1942-44: The North Caucasus, the Kalmyk Autonomous Republic, and Crimea". Kritika: Explorations in Russian and Eurasian History. Slavica Publishers. 6 (2): 285–318. doi:10.1353/kri.2005.0029. ^ Mawdsley, Evan (1998). The Stalin Years: The Soviet Union, 1929-1953. Manchester University Press. ISBN 9780719046001. LCCN 2003046365. Beattie, J.M. (1986), Crime and the Courts in England 1660–1800, Oxford: Oxford University Press, ISBN 0-19-820058-7 . Beattie, J.M. (2001), Policing and Punishment in London 1660–1750, Oxford: Oxford University Press, ISBN 0-19-820867-7 . Ekirch, A. Roger (1987), Bound for America. The transportation of British convicts to the colonies, 1718–1775, Oxford: Oxford University Press, ISBN 0-19-820092-7 . Hitchcock, Tim; Shoemaker, Robert (2006), Tales From the Hanging Court, London: Bloomsbury, ISBN 978-0-340-91375-8 . Robson, L. L. (1965), The Convict Settlers of Australia, Carlton, Victoria: Melbourne University Press, ISBN 0-522-83994-0 . Sharpe, J. A. (1999), Crime in early modern England 1550–1750, Harlow, Essex: Longman, ISBN 978-0-582-23889-3 . Shoemaker, Robert B. (1999), Prosecution and Punishment. Petty crime and the law in London and rural Middlesex, c. 1660–1725, Harlow, Essex: Longman, ISBN 978-0-582-23889-3 .